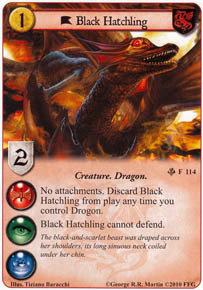 Discard Black Hatchling from play any time you control Drogon. Black Hatchling cannot defend. Flavor Text: The black-and-scarlet beast was draped across her shoulders, its long sinuous neck coiled under her chin.